Jim Carey in Bruce Almighty can walk on water. Criss Angel also pulled off that stunt before as well. Is it humanly possible? Probably not. A good magician never reveals their secrets. The location of this photo can help us average joes achieve the illusion of walking on the clouds. That is much more difficult than on water. 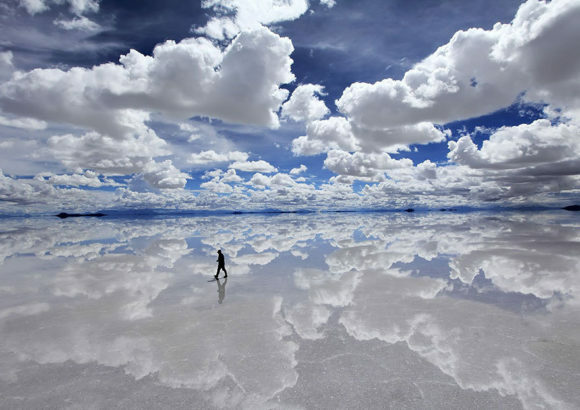 You’re not walking on the clouds-although you will feel like it when you explore Bolivia’s Salar de Uyuni, the largest salt flat in the world, where a desert of salt spans more than 4,500 miles.